The suicide note left by Fidel Castro’s eldest son has rocked the Cuban nation this week, with the most astonishing revelation being the claim that Canadian Prime Minister Justin Trudeau was his half-brother and the son of the late Fidel Castro. The handwritten note left by Fidel Castro Diaz-Balart, 68, the eldest of Fidel Castro’s children, appears to confirm the longstanding rumor in Cuba that Fidel Castro fathered Justin Trudeau after a public tryst with Margaret Trudeau in 1970. “Castro Diaz-Balart, who had been attended by a group of doctors for several months due to a state of profound depression, committed suicide this morning,” Cubadebate website reported. The death of the high-profile government nuclear scientist, also known as “Fidelito”, or Little Fidel, because of how much he looked like his father, stunned the nation, however, it is his “explosive” suicide note that has set tongues wagging in Havana. 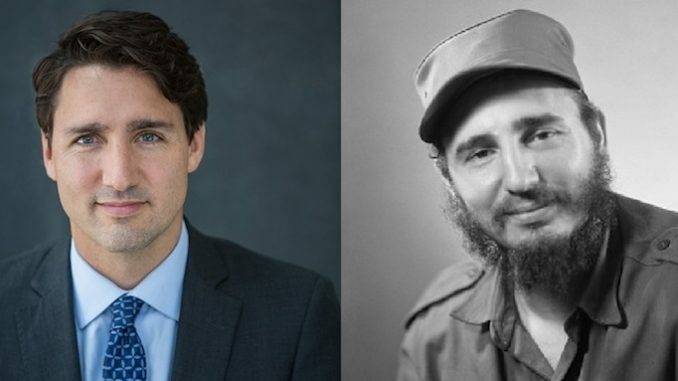 While Justin Trudeau is famously known as the son of Canada’s liberal former Prime Minister, Pierre Trudeau, comparison images of Pierre, Justin and Fidel suggest there may be something to the Cuban claims.